Does she know something we all should know? It’s not your dream career trajectory: Living (and working) in a locked facility for chronically mentally ill to get through college. Sliming fish on an Alaskan production line. Braving Arctic winds and a dozen macho racist shipmates for a year on a fishing skiff. Broke, in New York, solving the problem with an ad that reads: Alaskan Bush Woman seeks room and board in exchange for tutoring in the arts and/or companionship. . . It worked for Ann Randolph. But she would be the first to say it wasn’t exactly a piece of cake. 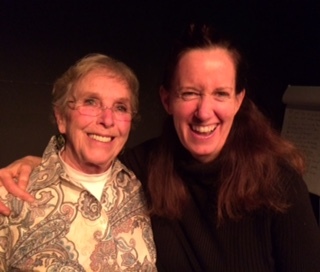 Actress/comedienne Randolph is currently on stage at San Francisco’s Marsh Theater with her solo show “Inappropriate In All the Right Ways.” It’s part autobiography (she was told early on, “Ann, that’s inappropriate”) part stand-up hilarity, part therapy and 100% fun. Randolph is best known recently for her solo show Loveland (“Riotously demented and brilliantly humane,”) but she’s been making headlines for a long time. Her life and career path have featured stunning successes – Best Solo Show awards in San Francisco and Los Angeles, a long list of other awards and citations for acting, writing and directing – and crushing lows. Among the latter would be the incidents cited above, alongside her close friendship with Mel Brooks and his late wife Anne Bancroft, who recognized her genius and were backing the progress of her solo show toward Broadway when Bancroft was diagnosed with the cancer that would soon end her life. Randolph, though, does know this: it’s not about the highs and lows, it’s about the trajectory. Through her shows, her writing workshops, and her generous pro-bono appearances before groups like the end-of-life nonprofit that caught the attention of this writer, the high-energy Randolph explores that theme. And following life trajectories is Adventure Theater at its best. Randolph pulls her audiences into the act with markers of her own ups and downs – Sacrifice! Synchronicity! Visualization! Fake it ‘til you make it! – and then turns the tables. Given pencils and ruled tablets when they entered, audience members are invited to do 5-minute life lists of their own. When time is called there’s a jazzy sing-along moment and then – spoiler alert – they are also invited to take the stage. Nobody leaves a performance of “Inappropriate” without being moved to laughter; many leave after discovering something about their own life trajectory. It’s a show like no other. If you’re in San Francisco before “Inappropriate” closes (it’s been extended! 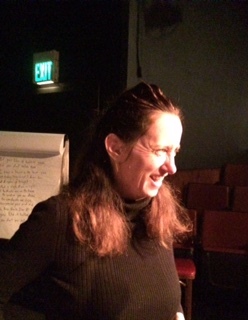 Weekends through 12/13) you can catch Ann Randolph in a show. Or find her doing a writing workshop near you.